Mobio Talks interviewed a couple of speakers from White Nights Moscow 2016, which took place on October 11-12. Today we publish the conversation of Anton Krokhmalyuk, CMO at Mobio, and Tanya Evdokimenko, former Head of the Kiev Playrix office. According to the recent report from App Annie, Playrix is one of the Top 20 best gaming companies in the world and the second one in EMEAR. How did you achieve that? I must say that App Annie includes not the best companies, but the most successful ones, so I don’t want other developers to feel deprived. Our plans are far-reaching: we want to move forward. It is very exciting to be in the second place after Supercell, and both of us are aiming to create only hit-games. Is it possible to copy your games or hits from Supercell and earn some money with the clones? That’s no secret that we are inspired by the ideas of other games, but don’t copy them. Anyway, we don’t mind the clones of our games. The mobile gaming market is a fast growing industry. What was hot 9 months ago and inspired you may be irrelevant by the time you release your clone game. Moreover, while you copy someone’s game, your primary competitor is not standing still. He develops the game, introducing new content and rolling out updates every month. Everyone enjoys talking about their hit games, avoiding mentioning of fails. Could you tell me about yours? Did you have any? When is the time to stop working on the game? I like talking about fails. You can’t move forward without them. We openly tell the story of the Sky Charms game, which was released this spring. We stopped supporting this project because the game couldn’t reach the hit level. There is beautiful design with rich, thorough content, but retention numbers were not as high as we wanted for a potential hit. Did you realize during the soft launch that the game should be closed? We are releasing an improved version of the game in soft launch. We cannot afford a luxury of launching something raw or MVP (minimum viable product). Our TTM (time to market) is a bit different from the traditional one, so successful soft launch release doesn’t guarantee to be the same after worldwide release. We spend a lot of time on analytics — we have some metrics on which we focus. We don’t try to hide them, they are well known. When the game falls short of something, we continue to improve it, but in Sky Charms it wasn’t possible. And where is the borderline that shows whether to fight for a product or to give it up? When Sky Charms was released we already had such titles as Township and Fishdom published, so it was clear what to look up to. We saw the metric of Sky Charms and realized that this would be considered a successful project for any other company in this genre. I can’t say that this game is financially unsuccessful. It’s just not as good as we wanted, not a hit one. What did you do with this game? It’s still available in mobile stores, we just don’t support it anymore. You release games for iOS, Android and the Web — a lot of platforms! Which of them do you aim the most? The main platforms for us are iOS and Android. In addition, we launch games in Mac Store and Amazon. What about Windows Phone or social networks such as Facebook or VK? Do you think that a game should be available on as many platforms as possible? The game should be available where the player is waiting for it. Playrix focuses on the platform I mentioned above and conducts experiments from time to time. Gardenscapes will be released on Facebook. We don’t plan to release the game somewhere else on the web. Speaking of Windows Phone, our game Township is available there. I can’t say when, but we’ll release our other games there too. It’s common thought that Windows Phone isn’t as significant as iOS or Android. Of course, revenue from Windows Phone isn’t in the first place in our financial reports, but there are people and they are waiting for our games. Your staff is more than 400 people, how many of them are engaged in promoting and developing? We have a strong promotion department — more than 60 people (there are 450 employees in the company). In addition to the traffic managers or UA-managers, there are programmers who set up analytical systems and analysts, designers, and so on. How do you get traffic for your games? We buy traffic from all sources with profit margins. One of the most interesting sources is video advertising. Sometimes it can produce up to 50% of the traffic. I would divide other 50% between Adwords, Facebook, and other ad networks. We are planning to improve the existing channels and perhaps in some time to change the distribution. How do you work on virality? Do you have cases implementing a single tool and receiving a huge number of free installs or shares? We examine what works for our competitors and implement these things in our viral mechanisms. There are companies that plan virality while calculating margins and future income. We don’t. We focus on being featured by the platforms. We try to make the highest quality games, so the platform itself wants to feature them. But mostly we focus on traffic purchase planning our future income. How do you work with your audience? Primarily, we focus on the customer. We don’t make a game for the producer, who is full of dreams, not for the development team to make it easier and faster — we make a game for the player. We want to reach out to the user in every possible way, we even send newsletters after updates. Our community management and support department are really strong. We communicate with players in all major social networks. By the way, I like ‘Ask me anything’ concept, when the development team answers any questions from users. Can you name new tools of user acquisition? We believe in retargeting. Do you use it or something new? We can’t say that retargeting is a new tool for us. It is a routine already. In future, I hope to work more with influencers. 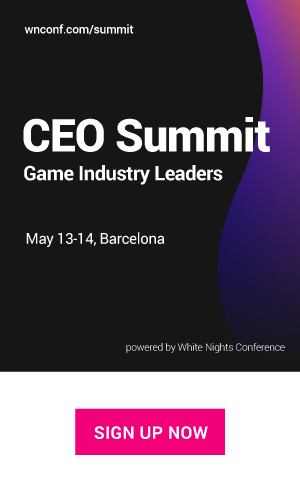 There is a lot of talk at the White Nights Conference, and in general, about the fact that the entire industry will be taken over by VR and AR games. What should happen to Playrix to make you launch a VR or an AR game? Personally, I think that the industry and the technologies are not ready yet, and the market too. In the future, a niche of the gamedev industry will be occupied by augmented and virtual reality, but I can’t say that today we are ready to drop everything and re-qualify for such development. So, how to launch a game and earn a lot of money? Please, name three main steps. First of all, when you are choosing the setting, genre, and platform, it is important to define the target audience of the game. Then you have to determine the team responsible for the game. The team is the key to success. And the third thing is to understand what’s going to happen with the product. The game shouldn’t just be released: pre-production and production are parts of the game’s existence. It is important to understand the ways of promotion of your future project.